I obviously haunt Courtney Milan‘s blog because she’s clever, articulate, and all of that – I found this post of hers about self-publishing v. traditional publishing really interesting. I have no interest in writing, but I find industry posts from the author’s perspective fascinating. Kind of random, but this post by Sherwood Smith @ Book View Cafe on everyday phrases that relate to anachronistic objects (plus comments) made me think. It’s like the phrase “dial in” – I can’t remember the last time I used a phone with a rotary dial, but I still use the phrase every day, e.g. “Can you add a dial-in for that meeting as I’ll be working from home?”. And everyone knows what you mean! Do you know what my first “proper” romance book was? I don’t mean one of those Sweet Dreams books (anyone read those, by the way?) or a M&B/Harlequin (which I graduated to after running out of Sweet Dreams books). I mean a full-length romance novel. The book was Justine Davis‘s THE SKYPIRATE (and yes, with that very cover – I know, I’m not quite sure how I got it past my mother either). I loved it (as you may suspect, there were dashing sky-pirates, hidden identities, missing heirs, and equal amounts of angst and action), and it was the start of my romance reading career. So very good memories – I’m pretty sure I read and re-read the book many times over, until poor Fabio (it is Fabio, right?) was practically separated from the rest of the book. Justine Davis has announced she’s re-releasing THE SKYPIRATE and its prequel (which I never managed to track down), PLUS writing the long-awaited wrap up to the trilogy (because threads were left hanging…). I am very very excited. So – has anyone else out there read THE SKYPIRATE before (it’s a mid-1990s release according to Goodreads)? And do you have equally good memories of your first “proper” romance novel? Here’s a pretty long list of March releases that I’m eyeing (plus a whole load of maybes). Also, Andrea K Höst‘s HUNTING is now scheduled for a March release, so lots of book goodness this month. Patricia Briggs‘ FROST BURNED (UF): *inarticulate noise* Yes, I’m that excited about a new Mercy Thompson story. It’s been one of the very few books I’ve actually pre-ordered this year. I’m wondering if we’re going to see the repercussions of the events in the last Anna & Charles book in FROST BURNED – I hope so. Miranda Kenneally‘s THINGS I CAN’T FORGET (YA romance): Miranda Kenneally’s CATCHING JORDAN was an unexpectedly good read when I stumbled upon it last year, so I’m all up for a new book in her Hundred Oaks setting (this is termed a companion book, which appears to be a quiet trend in the YA space). Seanan McGuire‘s MIDNIGHT BLUE-LIGHT SPECIAL (UF): So I didn’t quite love the first InCryptid novel, but this is Seanan McGuire. I’m giving this series another go. 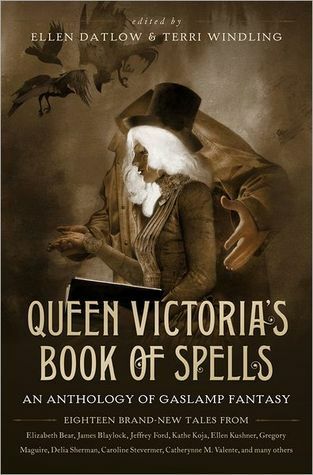 QUEEN VICTORIA’S BOOK OF SPELLS, edited by Ellen Datlow and Terri Windling (YA fantasy): The subtitle is An Anthology of Gaslamp Fantasy, which just intrigues me. Teresa Grant‘s THE PARIS AFFAIR (historical mystery): I’m a long-time fan of Teresa Grant’s books and am looking forward to a new installment in Suzanne and Malcolm’s life. Her novels are packed full of historical detail and political intrigue; add the rather complicated relationship between Suzanne and Malcolm and you get a very satisfying read. Jennifer Nielsen‘s THE RUNAWAY KING (MG/YA fantasy): I liked but didn’t love the first book in this trilogy (THE FALSE PRINCE) so this is on my library reservation request list. Nalini Singh‘s WILD INVITATION (paranormal romance): Another library reservation request, I think – primarily because I’ve read both of the previously-published short stories in this anthology. I’m not keen on paying full price for two new stories. Eloisa James‘ WITH THIS KISS (historical romance): Normally Eloisa James is an autobuy author, but I’m not sure this serial-in-three-parts will work for me. I’ll wait on reviews. Jacqueline Winspear‘s LEAVING EVERYTHING MOST LOVED (historical mystery): Her Maisie Dobbs books are hits or misses with me, so I’ll probably play safe and borrow a copy from the library.